X-rays can often be very beneficial in diagnosing and monitoring many medical and surgical conditions. Our radiology department includes a digital table top x-ray machine as well as a dental x-ray machine. These machines give us the ability to take high quality radiographs of anything ranging in size from a small hamster, mouse, or lizard to that of a St. Bernard’s abdomen or the deep chest of a Great Dane. Digital radiology gives us very detailed images, which allow us to get the most information from each radiograph that we take. 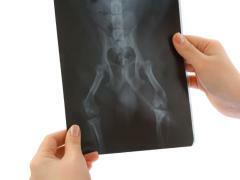 Bones can be evaluated for fractures, growth and developmental problems, arthritis, and cancer. Soft tissues can be evaluated for tumors, heart and lung disease, changes in organ size or shape, the presence of abnormal air or fluid and foreign bodies such as coins, fish hooks, string and golf balls. It is a fascinating view inside the body that can assist the doctor in evaluating the care your pet needs. Some conditions that can be diagnosed with dental x-rays are tooth root abscesses, retained or impacted teeth, broken tooth roots, jaw fractures, and bone infections or cancer. Our dental radiology unit can also be used to get very detailed images of the skull to evaluate for sinus disease, chronic sneezing, or problems with the bones around the eyes. Please see our Radiology Album in our Gallery to view some of these images! Dr. Tarrant and his staff are the best !!!. We take all of our animals to him. One of my cats injured his back a couple of months ago, Dr Tarrant did accupuncture for his injury and you would never know he had been injured. I am a firm believer in accupuncture when an injury first occurs, Smokie is living proof of that. I don't know what we would do without Dr Tarrant !